We welcome you to our web site in the hope that you will find the weatherstrip that best fits your profiles. Over 20 years of experience provide us recognition as European manufacturer specialized in the production of weatherstrip seals for all kinds of aluminum, PVC and timber profiles. Tecseal team is fully committed with the company and willing to provide solutions to our clients, thereby bringing added value to our product. Customer service is our hallmark and essential key when supplying our products all over the world. Currently, you can obtain our products through our official distributors or alternatively, by contacting us directly through our commercial department. 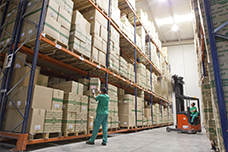 Currently, you can find our products through our officers or contact our sales department distributors. The company was created in 1992 with the aim of growing worldwide as well as widening the range of products. Official distributors were set up throughout Europe and as we enlarged our portfolio, we began creating new products to meet customers’ needs. We began by manufacturing standard woven base, single fin, monofilament and adhesive backing. Some years later, Tecseal embarked on a journey into the world of extrusion, and today we continue developing over 100 new projects every year. 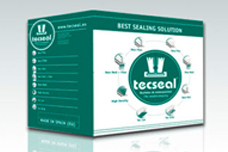 In 2004 we enlarged our production with the acquisition of a new technology system, thanks to which Tecseal became the leading manufacturer of sealing solutions. Currently we are the exclusive manufacturers of this new technology in Europe. This production system enables us to manufacture an on-line central weatherstrip, which is easy to insert in any kind of profile. This technology enables us to manufacture the high-performance product called TRIFIN. In a sliding system TRIFIN guarantees class A4 air-tightness based on Classification Regulations: UNE-EN 12207:2000.